If there's one thing we all have in common, no matter where we live or what country we live in - at some point in time we could probably become an interpretive moment in some cemetery somewhere. It is a huge "universal concept" - thus our attraction to old, historic graveyards and the stones that reach through time to tell us something about their below-ground owners. This course is designed to help historians, historical societies and communities that would like to share with visitors the stories of the people, personalities and contributions of the people who populate local cemeteries. The course will help you, in a most respectful manner, reveal to the living the stories of the past, and the gravestone art that is part of the messaging. - New York State University. Adjunce Professor, Heirtage Tourism Institute. - Sr. Instructior, Kansas State University - Global Campus (Interpretive Planning). Unit 1 - Overview of heritage interpretation theory and principles for interpreting historic cemeteries and gravestones. Unit 2 - the model of interpretive planning for developing your cemetery interpretive services, programs and media. Unit 3 - Policies and management issues for developing interpretive programs/services for your particular cemetery. Are there rules or regulations that the cemetery owners/managers have in place that will affect the kinds of interpretation you can do? 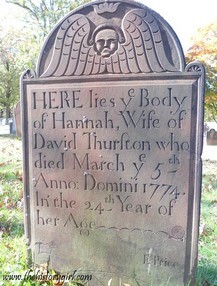 Unit 4- Inventorying your cemetery resources: gravestone carvings diversity, historic figure burials, community founders or past leaders, revolutionary war/civil war veterans, witches (as in Salem MA historical burials) etc. Unit 5- Developing your gravestone/marker map for potential interpretive self-guiding walks or for future live guided programs. Unit 6 - Developing your gravestone/cemetery interpretive theme and program/services objectives. Unit 7 - gravestone symbols and what they mean (what symbols do your gravestones have?). Unit 8 - Developing self-guiding thematic cemetery tours. Unit 9 - Developing interpretive panels for permanent interpretation of specific stories or history for your unique cemetery. Unit 10 - Developing live guided cemetery walks and programs. Unit 11 - Developing "visitor from the past" interpretive walks and evening experiences. Unit 13 - Developing your web site to have PDF's of cemetery tour brochures or downloadable video interpretation for cell phones. 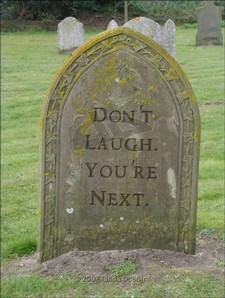 Unit 14 - Marketing and promotion for your gravestone and cemetery interpretive experiences. The cost for the estimated 20 hours training with live interaction with the instructor is $200.00 USD. 2. If there are openings you'll be sent a simple registration form to fill out and return to John. If there are not currently any open spaces JV will let you know and if you wish, add you to the participant waiting list. 3. Once you receive your regisgration form/placement confirmation, then you can pay the course tuition. You can pay by credit card or paypal here at the web site (below). If paying my check, you can mail your payment to John Veverka at the address below. 4. Once all this business bit is completed, John will send you Unit One and all related course materials and an e-copy of his text book "Interpretive Master Plannning". He will also be happy to chat with you as well to make introductions and get you going.